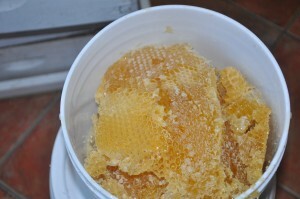 Posted on August 13, 2012 | Comments Off on Phil’s latest beekeeping blunder! I think beekeepers appreciate the fact that I will readily confess to making mistakes, especially with regard to beekeeping. Many times I’ve heard beekeepers reluctantly admit to doing something that caused them problems in the bee yard. They seem relieved when I say, “I did that once” or “let me tell you what I did…”. Well, I did it again and I even made the same mistake more than once this year. And while not causing any serious damage to a hive, it has caused me (and my bees as well) some inconvenience. I’m talking about leaving a frame out of a hive body. 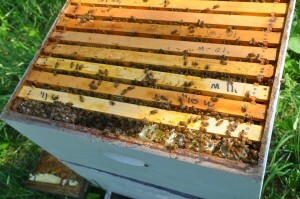 This usually happens when removing frames from deeps while making nucs or perhaps removing a brood frame containing a queen cell and not having a replacement frame to put back in its place. The worst part of the error is that I typically have a frame in my house with drawn comb or foundation and am just too lazy to go at once and get it. I say to myself “I’ll bring one tomorrow” and of course tomorrow does not come, or at least not before the bees get impatient and decide to build comb without a frame, they really don’t care you know. Below is a photo of a missing slot in a deep brood box, taken in my apiary in May. But this is far from the worst. I failed to take a photo of the worst, but I have one of the aftermath, taken yesterday, while pulling the last of my honey supers. Do you know what this represents? This represents FOUR missing frames in a honey super! This came about after extracting honey and ending up with an odd number of frames of drawn comb in honey supers, which were then put back on the hive. 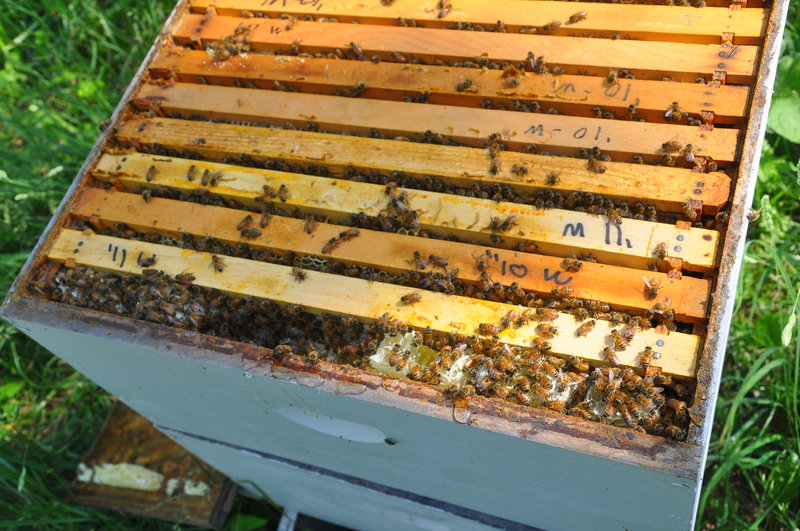 It may be the result of honey super comb damaged (and then removed from service) during extraction or it may be from reducing the number of frames in supers of drawn comb. Either way, I ended up with only about five frames in a super and the super among a stack of taken back to the apiary for putting back on my hives. Instead of taking the super back to the house after discovering my error, I thought “I’ll bring some frames tomorrow….”. I think that thought occurred in June and tomorrow, of course, never came. They bees made several beautiful frames of comb honey in the super, which I cut out yesterday and placed into the bucket. Live and learn? I think sometimes I never learn. This entry was posted in Hive management, Removing and processing your honey crop. Bookmark the permalink.